Ernie's is a place you can trust.. very friendly, honest, and knowledgeable staff . Ernie's Service Center is happy to provide our Felton auto repair customers with a complimentary courtesy shuttle. We aim to make your auto repairs and service as convenient as possible. Call us today! Very few companies in the industry pass the rigorous rating procedures to receive this certification. 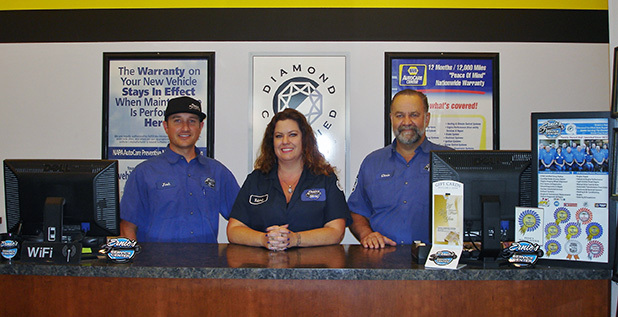 At our Felton auto repair - Ernie's Service Center, you can be assured that you will receive the same quality work which was recognized with the Diamond Certification. Our Felton auto repair - Ernie's Service Center has the know how, they have the tools, they have the experience to service any and all makes and models. Being an Independently Rated Highest in Quality Diamond Certified business, customers can feel confident with Ernie's. Employing ASE Certified Master Technicians and providing a two year, 24,000 mile warranty on all work performed assures total customer satisfaction. A Napa Auto Care peace of mind Nationwide warranty is also included.